When I am researching blog posts I often scurry off on intriguing tangents. Writing about the Claddagh got me thinking about the history and meaning of Celtic knots among other things, so today I am returning to Ireland to tie up some of those loose ends. I have significant amounts of Irish heritage and have often thought about dabbling in the art of Celtic knots. It would be a great achievement to create interlacing of such intricate nature and rich history. Celtic stock has been traced back to Austria during the Iron Age (800B.C.E. to 43C.E. ), when a tribal nomadic community lived in a salt mining region called Hallstatt. They developed into what is called the La Tene culture and expanded across Europe, coming into territorial conflict with the Romans. The mighty Romans forced them north, spilling out into the British Isles. Defeated, the Celts disbanded during Roman occupation in Britain and survivors joined Anglo-Saxon kingdoms. Meanwhile, other Celtic countries remained standing, chiefly in Cornwall, Wales, Ireland, Scotland, Isle of Man and Brittany. During the 4th Century C.E., Christianity was introduced to Ireland and began to convert the pagan population. 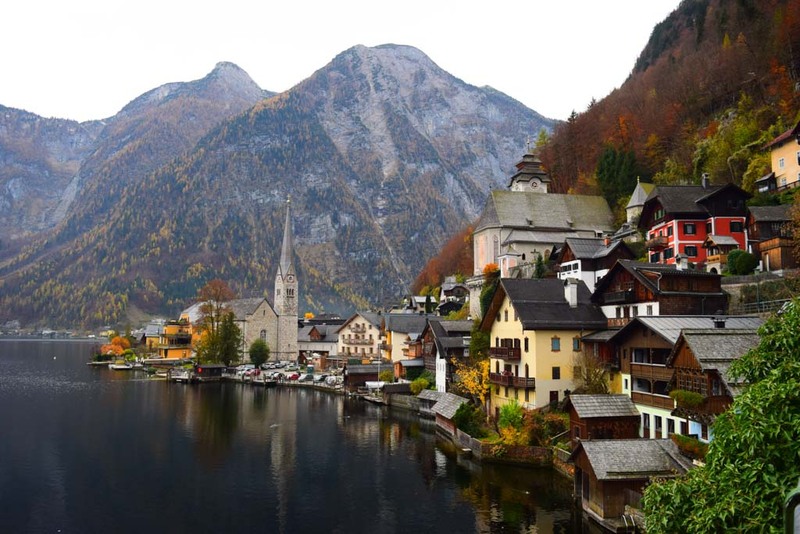 Hallstatt, Austria as it looks today. 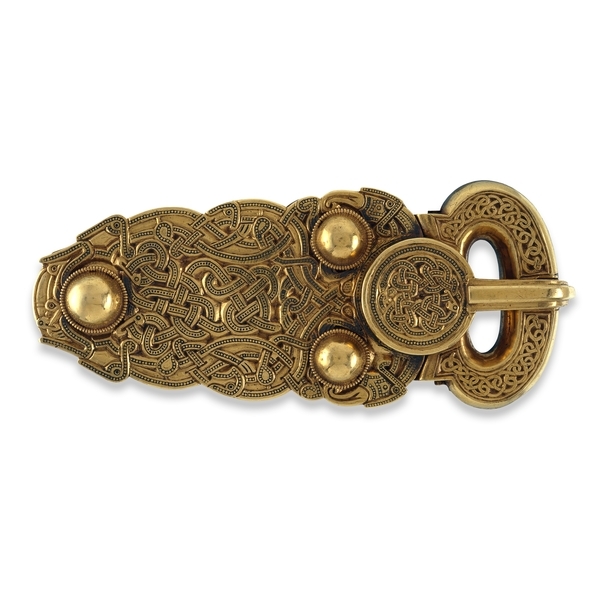 The pagan Celts had a decorative style that included knotwork, keys, and spirals. From where they adopted these symbols and their meaning are a subject of great debate. The Romans used knots in handicrafts and mosaic floors as early as 3rd & 4th century C.E, and knots are now known to have been significant in other ancient cultures. 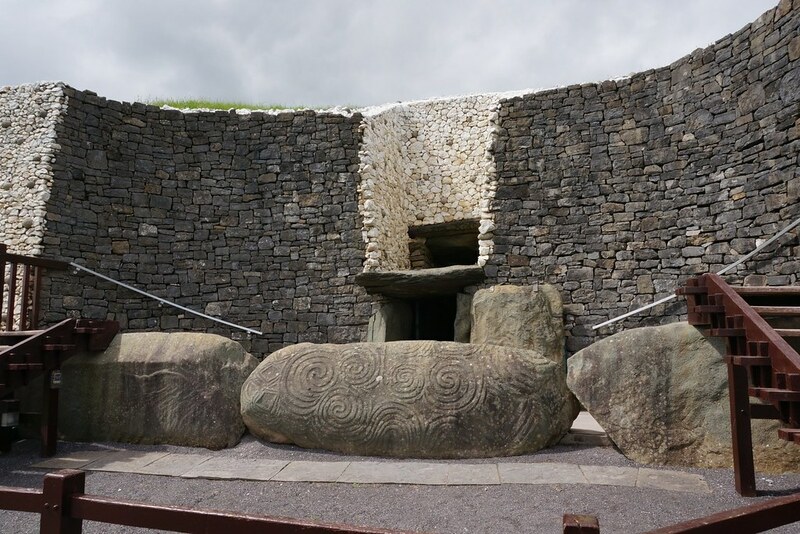 So although not unique to the Celts, it was they who developed and maintained the specific art form that we associate with Ireland today. St Patrick and his Christian cousins used local Pagan symbols to endear Christianity to the pagan population. 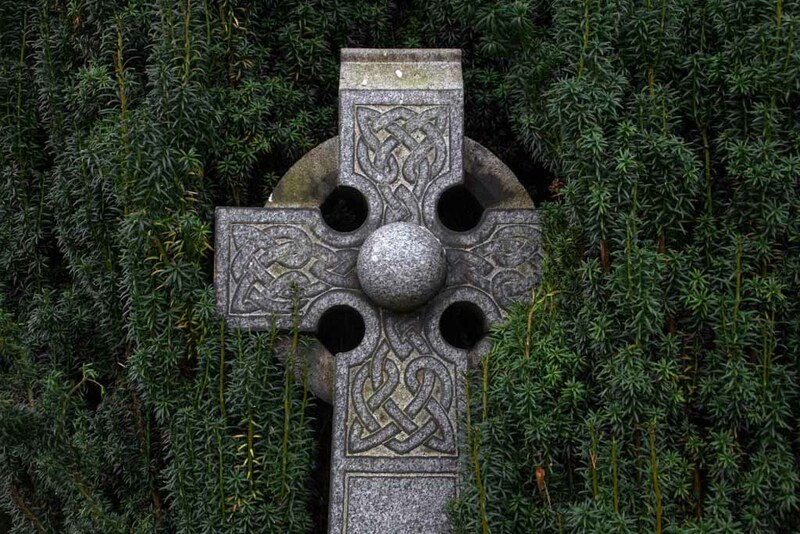 They repurposed motifs such as the three leaf shamrock and Celtic cross to tell their stories of faith in a way that was familiar and relatable to the Celts and would win their favour. Irish and English monks sitting in the quiet tranquillity of their monasteries decorated their calligraphic bibles with increasingly ornate forms of these symbols, knots and interlacing patterns–which came to be known generally as Insular Art. The resulting, highly decorated texts are called illuminated manuscripts of which arguably the most famous example is the Book of Kells, held at Trinity College in Dublin, Ireland. Viking raids eventually disrupted the development and production of Insular art and it merged into the next era of art history, Romanesque Art. A Celtic knot is unique whereby it is created from a single continuous and unending cord. Whereas the Germans and Romans tended to leave loose ends lying about. Celtic knots also have a consistent under and over-woven structure. So what constitutes the difference between a knot and an interlace you ask? Well, I found it best explained like this: If two “ends” of the single cord are pulled and they tighten, the pattern is considered a knot. Alternatively, if by pulling the cord you unravel the design, it is an interlace. Any real expert on the subject will be reluctant to apply meaning to Celtic knots and related designs. While time has seen modern concepts and theories arise, it is very difficult to confirm what the true representations were. Some will even claim that they were purely decorative and have no meaning at all. 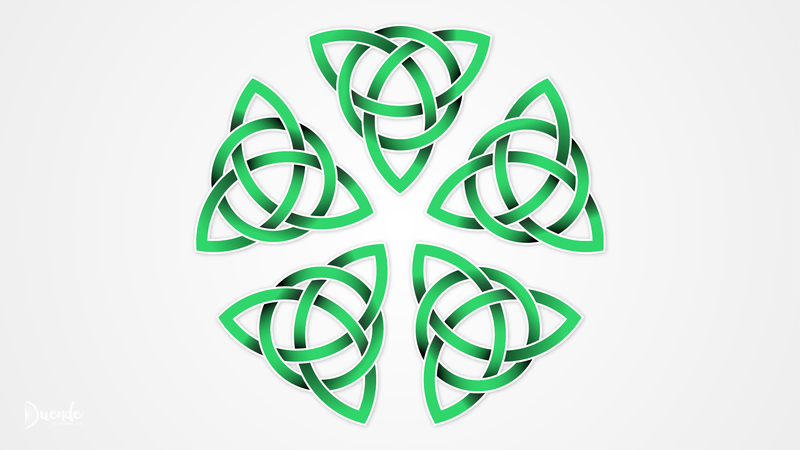 If you’re considering giving the therapeutic art of drawing Celtic knots a whirl, there are oodles of great online and offline resources available to get you started, such as Jo Edkins’ website. The information is presented in a simplistic format that won’t win web design awards but is very useful. There are a number of different methods taught, so it is worth looking around to find which one works best for you. I found David Nicholls’ drawing technique demonstrated in his Youtube video series, to be the most intuitive. I have created a printable 1cm grid especially for use with David’s method, that you can download for free here: Duende Celtic Knot Grid. Learn how to knot your scarf or necktie. Literally tie some knots including Celtic ring, love and square designs with this fab Youtube channel. Use your new skills to create jewellery, home decor or gifts. Style up a Celtic knot inspired hairdo or craft up a no-sew headband using an old t-shirt. Bake up some crusty bread knots to go with your Irish stew. Bead Trinity Knot earrings with this kit available on Etsy. Sew and stuff a knotted cushion in a heart shape or rectangular design. Weave a Celtic braid to use as an embellishment on your sewing projects. For more intriguing Irish history and culture, see The Claddagh – Let Love & Friendship Reign.